The fossils of two “exceptionally large” feathered dinosaurs have been discovered in a rock quarry in South Dakota, a find that may help answer some crucial questions about life in the ancient West, ranging from the nature of Cretaceous food webs to the evolution of flight in birds. The fossils were found in the Northern Plains’ famously fossil-rich region known as the Hell Creek Formation, which stretches from Wyoming to Alberta. But the newly found dinosaurs are the first raptors — feathered, two-legged carnivores — ever discovered in the formation, scientists say. And at 66 million years old, they’re also the most historically recent raptors to be found anywhere in the world. The team of paleontologists that made the find, led by Dr. Robert DePalma of the University of Kansas, has aptly named the new animal Dakotaraptor. And they say the raptor — known to scientists as a dromaeosaurid — was likely an able and important predator. “Dakotaraptor had a fortuitous combination of characters that made it a formidable predator: large body size and incredibly robust raptorial [foot claws] … and potential for speed and agility comparable to the smaller dromaeosaurids,” the team writes, in the KU publication Paleontological Contributions. Until now, the team notes, raptors have been conspicuously absent from the Hell Creek Formation, which was once a lush coastline that ran along North America’s inland sea. Dakotaraptor helps complete the picture of this Cretaceous ecosystem, the researchers say. “Dakotaraptor … fills the size gap that existed between the small [carnivore] and large tyrannosaurid groups, forming a predatory hierarchy more reminiscent of those actually observed in nature today,” they write. Those feathers make Dakotaraptor an even more striking find, their fossil traces being “unprecedented” in a dinosaur this size, they add. 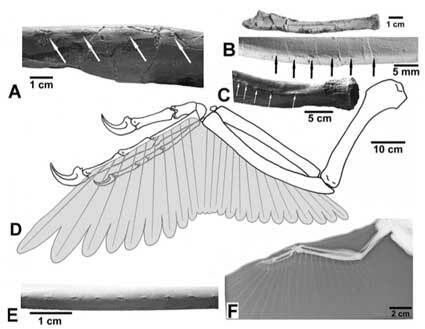 Among the two specimens’ many well-preserved bones are forearms with what the scientists say is the “first clear evidence for feather quills” on a large raptor. One of the slender bones that make up the forearm, or wing, of the dinosaur was found to have 10 distinct bony lumps, or bosses, that are each about 10 millimeters [0.4 inch] long — features that are nearly identical to the “quill knobs” found in modern birds, they say. “These low, evenly spaced bosses are indistinguishable from the quill knobs … in extant birds and other examples reported in theropod dinosaurs,” the team writes. Such features have been found in fossils of smaller raptors and proto-birds, including Archaeopteryx, Velociraptor, and Microraptor, the scientists say. But in modern birds, quill knobs are known to relate specifically to the feathers used for flight. 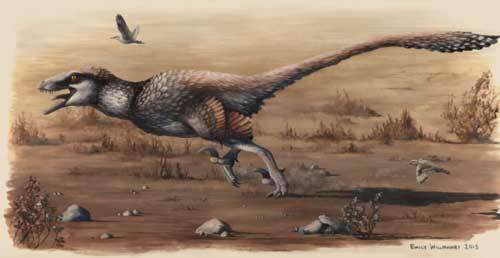 Of course, given that Dakotaraptor was about 5.5 meters [17 feet] long, it wasn’t capable of flying. Instead, the team suggests, the dinosaurs were likely what’s known as secondarily flightless — descended from animals that originally had the ability to fly or glide, but evolved over time into forms incapable of flight. 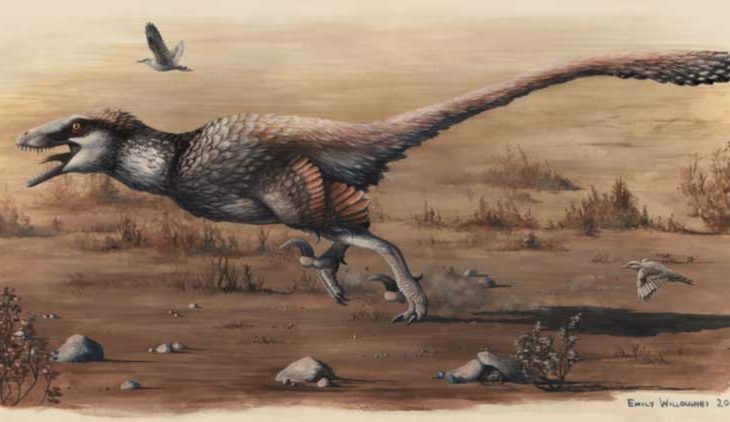 “[I]t is … plausible that Dakotaraptor descended from an evolutionary line that already possessed flight or that was already sufficiently close to attaining it that it had evolved a suite of advanced adaptations for its facilitation,” the team writes. Even if the feathers couldn’t help get the dinosaur off the ground, the scientists add, they may have had many other uses. “[E]xamination of certain extant flightless birds suggests that they could have played a role in hunting strategy, mating display, aggressive territorial behavior, and/or shielding the young,” they write. Overall, the discovery of Dakotaraptor poses more questions than it answers, but future research of these fossils may illuminate the raptor’s place in the dinosaur family tree, and perhaps even clarify the evolutionary relationships between extinct dinosaurs and modern birds.